Former Chicago Bull and two-time NBA champion Craig Hodges reflects on the killing of Laquan McDonald and the role of black athletes today. Craig Hodges—a Chicago native—played in the NBA for 10 seasons, in which he led the league in three-point shooting percentage three times. He won two NBA championships with the Chicago Bulls in 1991 and 1992, and is a three-time Three Point Contest champion at All-Star weekend. The Bulls were invited to the White House following their first championship. During the visit, Hodges, who dressed in a dashiki for the event to draw attention to his African heritage, gave a handwritten letter to George H.W. Bush. The letter urged the president to do more to fight racism and economic inequality in the United States. Hodges’s decision to speak truth to power at the White House ranks among the most significant political acts by a professional athlete in sports history. Following the visit to the White House, Hodges regularly called on his fellow athletes—as he did with Michael Jordan in The New York Times in the wake of the Rodney King beatings—to speak out on racism and poverty. He is nearly finished writing his memoir, which is expected to be released in the fall of 2016. Dave Zirin: Last week the Chicago police department was forced to release a dashcam video of police officer Jason Van Dyke shooting 17-year-old Laquan McDonald 16 times as the teen attempted to flee. On December 7, the US Department of Justice announced it will open a wide-ranging civil-rights investigation into the Chicago Police Department after examining police reports from the officers on the scene that conflict with that video. 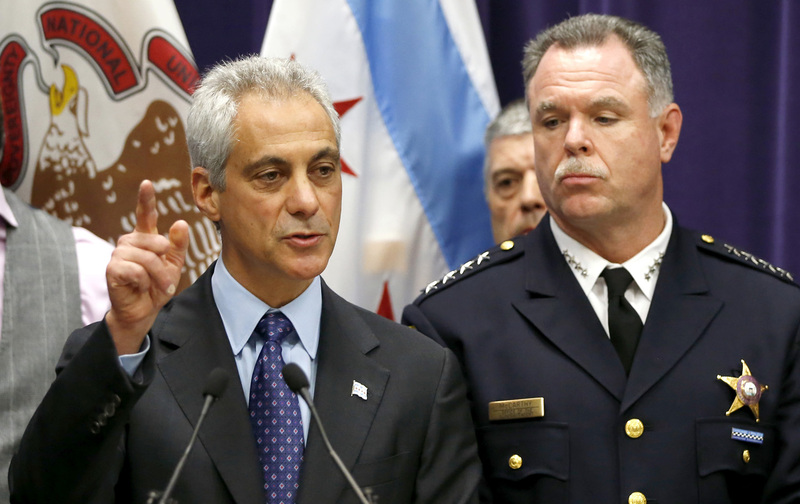 What is your reaction to Mayor Rahm Emanuel, Superintendent Garry McCarthy and State’s Attorney Anitia Alvarez decision to sit on the tape for 400 days? Craig Hodges: This is a clear miscarriage of justice and is emblematic of how corrupt our system is, regardless of who is in office, Democrat or Republican. It also shows that we can’t trust the police to police themselves. If it wasn’t for the work of a tenacious reporter and, more importantly, the effort of the Black Lives Matter movement, we would have never seen this tape. Black Lives Matter has cast a bright light on police violence and corruption here in Chicago and across the nation. The violence committed by the police on people of color is not a new thing in this country. Unfortunately, it took a large movement, a riot in Baltimore, and an endless number of YouTube videos to give it the attention it deserves. I’m inspired by this movement. I am looking forward to seeing it to grow and develop. DZ: Emmanuel has called for calm and healing since the tape was released. In light of the fact that he and his former police superintendent, Garry McCarthy, tried to bury the Van Dyke tape, do you think he’s in a position to ask anything of the black community at this point? CH: If the mayor had any credibility, it is gone. Emmanuel has no moral high ground here. The mayor and his former police chief are scared of the scrutiny. They are frightened of being exposed for what they are, and that is indifferent if not openly hostile to the condition of black people in Chicago. They are scrambling to say the right things in the hope that this all goes away, but the movement isn’t going to let that happen. Essentially, Emmanuel tried to cover up a murder. He is an accomplice as far as I’m concerned. His priorities rest solely in keeping the static off of the Gold Coast and the wealthy elites in this city happy. He could care less about black lives. The police continue to prove that they are not here to serve and protect or be impartial arbiters of justice. They are an occupying force on the south and west side of the city designed to keep the poor and disenfranchised away from the one percent. DZ: We’ve seen large numbers of protesters flood the streets of Chicago demanding justice for Laquan, calling for the funding of black futures, and an end to the police state that disproportionately affects people of color here in Chicago and across the nation. I know you have been an outspoken critic of police brutality over the years. How does the Black Lives Matter movement that has been demanding justice for the deaths of Mike Brown, Eric Garner, Freddie Gray, Rekia Boyd, Laquan McDonald, and many others compare to the movements of years past? CH: There have been ebbs and flows in the movement throughout US history: from slave uprisings, voter registration marches in the 1960s down south, to riots in Los Angeles, Detroit and Baltimore. Each historical moment is unique and requires different tactics. History will show how well we did or didn’t do in this moment. I like the way the current movement is connecting struggles: connecting police violence to school closings, and austerity in general. On what we can do better, I would say we have to do our best not to just react to moments as they happen. We have to anticipate within our communities. We have to plan actions that build off these marches. I’d like to see more school walkouts and strikes. I’d like to see boycotts when appropriate. I’d like to see a renewed call for reparations in this country. There are a lot of tactics. As long as we study our history and learn from past mistakes I am confident our condition will improve. We also have to unite not just in the black community but within broader class lines. If you are poor and white the system is not designed for you either. Black people absorb a disproportionate amount of abuse from the current social system in this country, and we must prioritize strong black leadership, but we need the numbers across the board to affect real change. Black, white, red, brown, yellow, and green must unite under common cause to fight oppression and exploitation in all its forms. DZ: The City of Chicago has paid out $500 million in settlements to victims of police abuse since 2005, with an untold number of shootings and violent attacks against civilians in the same period, do you think athletes could and should do more to draw attention to the issues of racist police violence facing the black community? As we saw with Thabo Sefolosha, the Atlanta Hawks star who had his leg broken by a group of New York Police Department officers outside a night club in New York last April, even high-profile members of the black community are not immune to the racist policing. CH: There is still a disconnect between professional athletes and the black community. I’d like to see it bridged. Most athletes are just happy to escape poverty. Athletes are scared that they will be blacklisted like I was if they are too outspoken. They are scared they will lose their money. They saw and were frightened by what happened to the Tommie Smiths and John Carloses of the world. I get that. That’s why it is always better to do things in groups. You’re less prone to attack when a bunch of your peers throw in for a cause. There is courage and power in numbers. DZ: Have there been any players that you have talked to or seen that inspire and appeal to your lifelong commitment to justice? CH: Everything you need to know about using your platform as an athlete to advance a political cause or fight an injustice can be learned from the University of Missouri football team. They recognized their value and withheld it until justice was served on campus and the president of the University resigned. They hit the university in the pocketbook, stood up for what was right, and won because they were united. The Bulls could do something similar here in Chicago in response to all this police violence and brutality on the south and west side of the city if they were so inclined. DZ: Do you have any advice for activists and leaders struggling fight exploitation, and oppression in the world right now? Trust your instincts when it comes to justice. You don’t need to worry about sounding sophisticated or having the perfect analysis. Speak from the heart, lead with your heart. You may feel isolated and lonely doing so but once you step into the ring, you will find confidence and deeper meaning as a person. You will also find others who think the same way you do. The knowledge and the ability to articulate issues will eventually come—people know a lot more than they think they do. I’d also say you’re not saying much if young people aren’t listening. The young people are the generation of fulfillment. You have to appeal to the students and young people. They are the ones who have the most to gain and to lose as well as the energy to get it done.